Serve in hoagie rolls for a home-cooked on-the-go dinner. 2 Combine bread crumbs with Parmesan cheese in shallow dish; set aside. 3 Add chicken and Light Mayonnaise to large plastic bag; shake to evenly coat. Remove chicken, then lightly coat in crumb mixture. Arrange chicken on cookie sheet. 4 Bake 20 minutes. 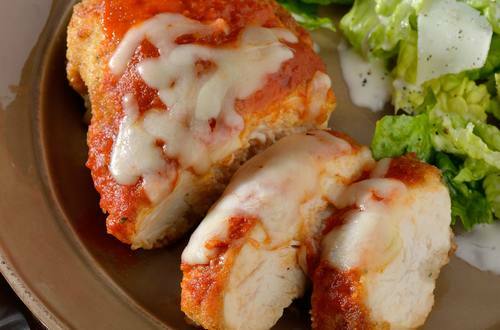 Evenly top chicken with sauce, then mozzarella cheese. Bake an additional 3 minutes or until chicken is thoroughly cooked and cheese is melted.